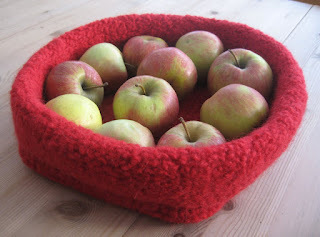 The first pattern I will share with you is my fruit basket. 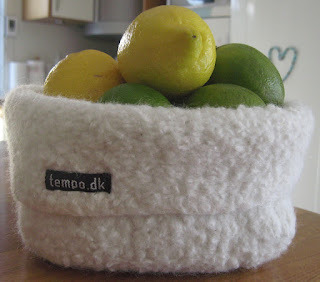 The baskets are knitted and afterwards felted in the washingmachine simply by washing it on 40 degrees celsius using a wool detergent. 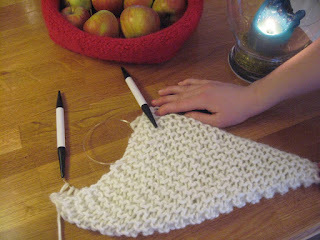 I used very thick knitting wool and knitting needles size 12 (Danish size). 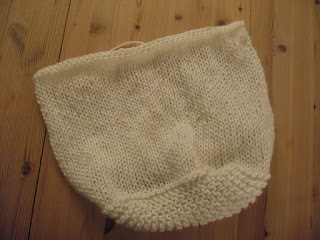 Cast on 30 stitches and knit until the piece is square. You can test this by placing the lower left corner of the knitted peace in the upper right corner. If it forms a perfect triangle, the piece is square. See picture below. Decrease 3 stitches on the next row. Pick up 27 stitches on each of the other three sides (you now have 108 stitches) and pearl one round. 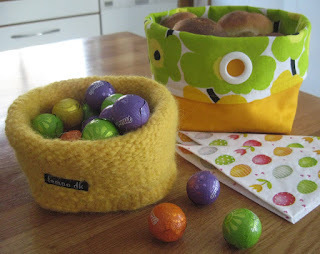 Then you simply knit around and around until the height of the basket is approx. 15 cm. Pearl one round and cast off. Cast on 20 stitches and follow the same procedure for the bottom. Decrease 3 stitches and pick up 22 stitches along the other sides = 88 stitches. Knit until the piece measures approx. 28 cm. Cast on 16 stitches and follow the same procedure for the bottom. Decrease 2 stitches and pick up 14 stitches along the other sides = 56 stitches. Knit until the piece measures approx. 20 cm.